The Danube Bend is a particularly scenic part of the river and its banks are home to a number of charming villages with plenty of attractions of their own. There are also a few impressive fortresses along the river, courtesy of the many invaders who valued the Danube as a trade and transport artery in Europe. The Danube Bend is close enough to Budapest to be a popular excursion from the city and bus and boat tours from Budapest are common. Esztergom is one of Hungary's most historically important towns; in fact, it was the capital of the country for more than 250 years. The ruins of the medieval Royal Palace and the Castle Museum are a must-see for visitors, and Hungary's largest church and first cathedral dominates the town and offers breath-taking views over the river. Visegrad was once a Roman stronghold and a popular haunt for Hungarian royalty in the 14th and 15th centuries. The Roman Citadel is still formidably well-preserved and the ruins of what was once Hungary's most magnificent palace are now the site of the open air King Matthias Museum. Vac is often less crowded with tourists than some other gems along the Danue. It is pretty, with wonderful Baroque architecture. The 11th-century cathedral and UNESCO-listed Memento Mori Crypt are the main attractions. 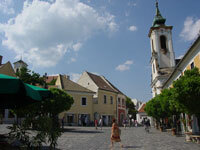 Szentendre is a quaint old market town and is one of the most beautiful villages in the region. It has meandering cobbled lanes, brightly painted old buildings, and a number of charming Orthodox churches. The village was a favourite with artists in the 1900s and has many museums and galleries to prove it. We are looking for contributors for our The Danube Bend travel guide. If you are a local, a regular traveller to The Danube Bend or a travel professional with time to contribute and answer occasional forum questions, please contact us.